Introducing Oven Roasted Never Fried! 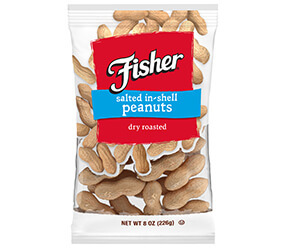 Oven Roasted Never Fried® nuts are made with nuts and sea salt. Seriously, that's it! No added oils. No artificial ingredients. No preservatives. Only the good stuff. Only the good stuff, nothing added! 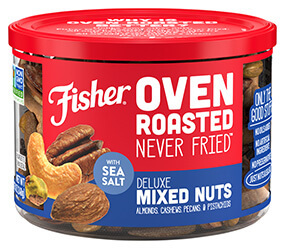 Our new Oven Roasted Never Fried® nuts are made with two simple ingredients—nuts and sea salt—to help you curb your next craving for a crunch. 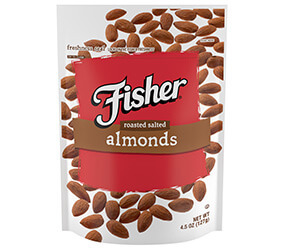 We start with tasty almonds, and then we roast, salt or season them to bring out their best flavors. Simple and delicious, it's a snack that will keep you coming back for more. We've picked a tasty selection of nuts from around the world to satisfy your snack cravings with the variety you want. 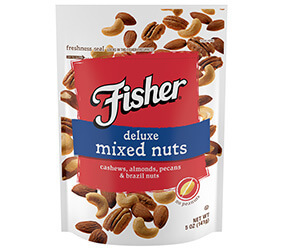 Choose a delicious mix of your favorites! 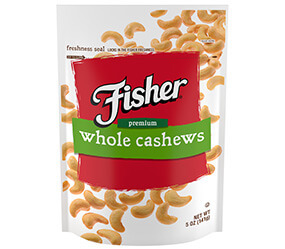 Enjoy a flavor-filled crunch from our Fisher® favorites! Choose from salted, honey, or butter toffee flavors to satisfy your sweet or savory snack cravings. 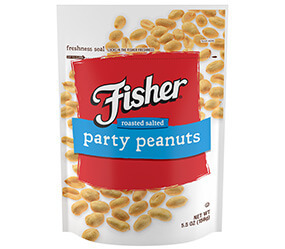 We roasted Fisher® favorites like premium peanuts and sunflower kernels and added salt and flavors to bring out the delicious crunch that everyone loves! The crack of the bat—the crack of the shell. 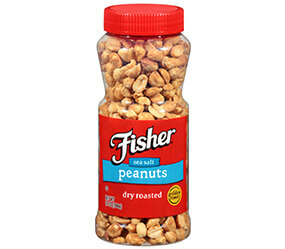 Fisher® brings the flavor of the ballpark home with salted and roasted in-shell peanuts. 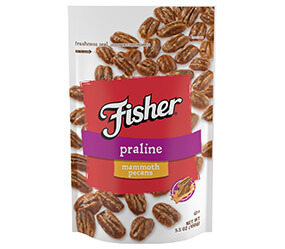 We’ve taken the perfection of premium mammoth pecans and enhanced their rich, savory crunch so you can enjoy even more roasted, salted flavor in each bite! Note: ‘Mammoth’ denotes an official size of shelled pecan halves that count 250 halves or less per pound as set forth in the USDA/AMS - United States Standards for Grades of Shelled Pecans (1969, reprinted 1997). 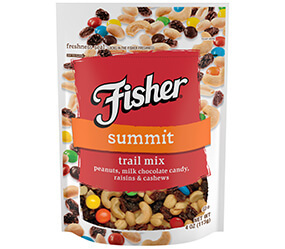 Fisher® trail mixes are packed with rich flavor and that signature crunch you crave. We mix only the highest quality ingredients to provide delicious, convenient options for wherever the trail takes you. Bring the ice cream parlor into your kitchen! 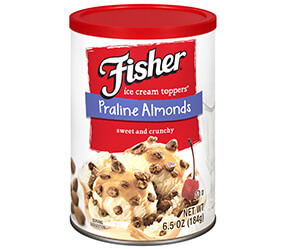 Our low-carb Ice Cream Toppers are the perfect crunchy complement to ice cream sundaes, cupcakes and brownies.